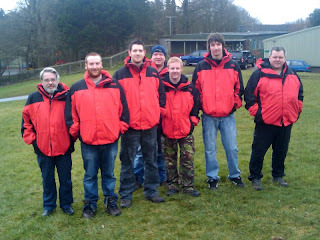 Above : modelling the snazzy new jackets before flagbreak on saturday morning. After a few years of everyone wearing randomly coloured outdoor gear at weekends, things have now got a bit more coordinated after a large consignment of superb outdoor jackets and gillets arrived last weekend. 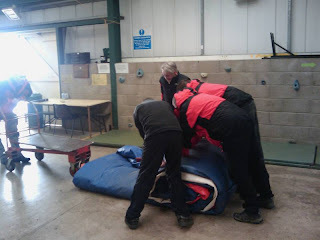 It was agreed a few months ago by the Fordell Board & Bob that it would be beneficial if the volunteers could have some new outdoor gear provided in an effort to look better to visitors and also to keep them a bit warmer and drier during bad weather. After a meeting with local firm Keela, who provided us with a great offer, most of the staff took up the option of ordering new gear and duly collected it last weekend. Despite a few sizing problems things seem to be sorted out now and the new gear seems hugely popular. Above : Testing out the new jackets on an unlucky person (guess who) during sunday's downpour. Soon after getting the jackets, the weather took a turn for the worse and gave some a chance to see how waterproof they really were. 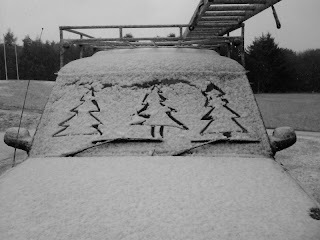 Above : A narrow victory for the rain as the staff rush to the safety of the hut. Saturday morning was fairly busy mainly due to a rearranged visit by Skillforce, who had cancelled a recent trip due to bad weather. A 3-hour activity block in the morning gave some of the fellowship who had recently passed their climbing assessments a chance to get in some supervised group experience, while the rest got stuck into a few odd jobs (and coffees). 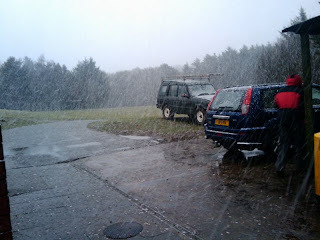 Above : Zipline training on sunday was cancelled for fairly obvious reasons. 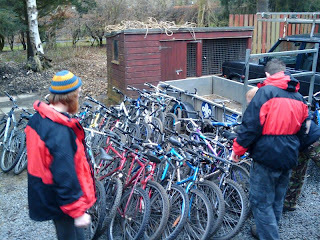 Saturday afternoon was much quieter until some silly person (not a million miles away from typing this blog) suggested it would be a good time to take all the mountain bikes out and give them a check. After taking over 10 minutes just to remove them from the activity store, it soon became apparent that it would be a fairly time-consuming task to service them all, so those needing work done were marked and moved elsewhere and the rest given a clean and routine service. Now we should have enough decent bikes to cope with normal weekend hires, and can work on the rest at our leisure as time permits. 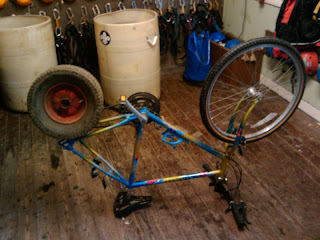 The bike store is also hugely less cluttered which should cause much less problems in the near future. Above : Tom tries to make a quick escape while the others are busy testing the bikes. Above : what we made with all the leftover bits of bikes. After the bikes it was time for saturday tea, with half the fellowship staying on site to make up bags of sweets for the shop and the other half having an exciting trip to the centre of world motor racing (Cowdenbeath Racewall) for the stock cars. 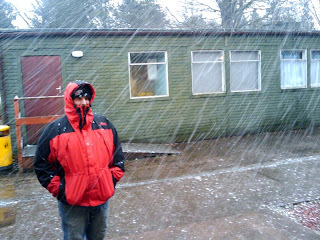 As soon as the stock cars finished, an amazing mini-hurricane hit Cowdenbeath, soaking those silly ones who hadn't bothered to wear their new jackets. The campsite was also hit by the freak weather, with one group's tent being blown away and the radio club having some of their wire antennas in the trees being blown down by the high winds. 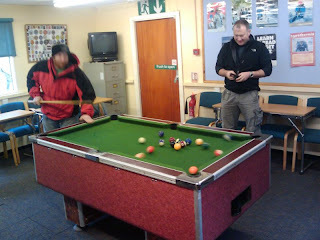 Above : Ali and Ginga seconds before being caught skiving by Bob. Onwards to sunday morning and it quickly became clear that the planned training session for the zipline wasn't going to happen, as the freaky weather continued with some snow. After struggling to think of something to keep everyone busy,Stevie hit upon the idea of testing out the new pool table which had recently been donated to the centre(and is now in the reception building). 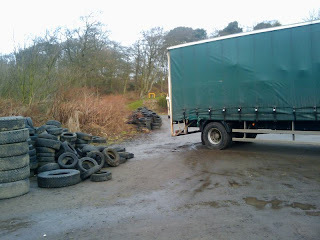 However, this plan didn't last longer than 5 minutes as Big Bad Bob appeared and insisted that everyone head out into the freezing cold and rain and move some wood from the carpark to the woodpile (and we couldn't use the excuse about not having decent waterproof gear anymore). Above : near disaster as tired Calum falls asleep inside the bouncy castle and gets rolled up inside it on sunday afternoon. 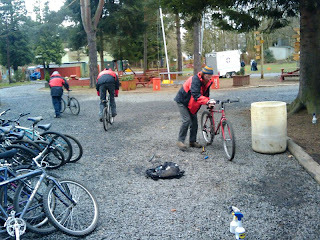 The rest of sunday was quiet in terms of activities, so everyone got stuck back into the bikes again and managed to service / repair about 6 more which was good going. Steve Spalding also popped in a couple of weeks ago to carry out assessments for the climbing and jacob's ladder, and the sessions went very well with a great attendance from the fellowship. 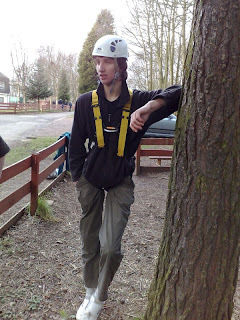 There were also a lot of newly-qualified rope instructors which will be a huge help during the summer, and since then some of them have been back in getting some group practice under supervision before they are allowed to start running sessions themselves. This weekend Steve's hopefully back again to carry out assessments the zipline (weather permitting) so hopefully we'll have a wee report up here shortly.